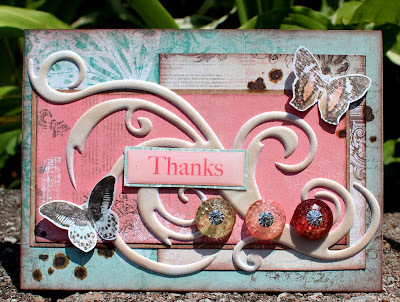 What a bunch of scrap...: Bo Bunny Card challenge! Bo Bunny always has the best sketches for monthly card and layout sketches, and I couldn't resist dipping into my 6x6 paper pack of Gabriella for the card. I made a little "Thanks" card. I still love this paper, isn't it amazing? The flourish is by Flourish With A Bling - this is the Jasmine puffy flourish in white. I inked it lightly with a beige to make it fit the vintage, distressed feel better. I love how well these flourishes take chalk ink. Great card Ilene!!! love it!